Events held in a pleasant and inspiring environment leave a lasting favorable impression. This emotional added value is but one of the many pluses that HAUS DER MUSIK offers you as an event location. Stylish centerpiece with classical flair. 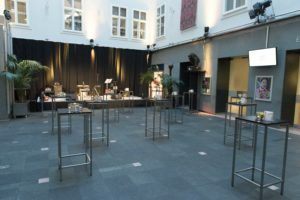 Haus der Musik’s glass roofed courtyard offers the ideal setting for receptions, banquets, intimate gatherings, company events, launching parties and so on – no matter what the wheater might be like outside. Equipment: Seating variable. Stage/Sound engineering on request. Outstanding acoustics and state of the art technology. Ideal for concerts and other performances, lectures, seminars, workshops, panel discussions or press talks. 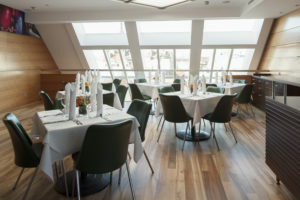 Haus der Musik’s auditorium is easily accessible via a glass elevator located in the museum’s courtyard; it is fully air conditioned with state of the art technological equipment that makes for a guaranteed successful event. Capacity: 140 with parliamentary seating. Equipment: Seating variable. Stage/Sound engineering available. The top floor – museum venue with a vision. Enjoy the incredible panoramic view over the rooftops of Vienna and St. Stephen’s Cathedral. The two levelled top floor awaits you with its unique atmosphere. Whether you wish to hold a stand-up reception or enjoy a five course dinner – there are no limits to your creativity. 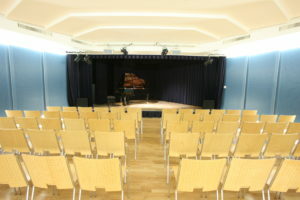 This venue is ideal when combined with events taking place in the adjacent auditorium. Capacity: 60 per level with café-style, 80 per level with high tables. Sound engineering for speeches available, additional equipment on request. Should you have any questions or would like to arrange an appointment to inspect the venues, we are happy to help and give you further information.